Mondelēz Malaysia (Mondelēz), part of the global snacking powerhouse Mondelēz International, today announced the launch of a new product variation for its belVita Breakfast Biscuits range, belVita Banana & Oats. The new offering is aimed at providing Malaysians with more options to enjoy a balanced and healthy breakfast. 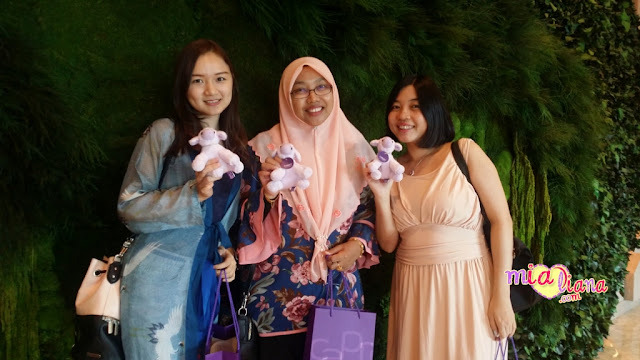 Speaking at the launch event, Sharon Tan, Head of Biscuit & Salty Snacks at Mondelēz International said, “Malaysians in general are aware that breakfast is the most important meal of the day, to fuel the mind, body and soul. Thus, it is vital for us to create a product that includes quality and nutritional ingredients that also appeals to the lifestyle and preferences of Malaysians. When we incorporate the highly nourishing banana and oats into our new product, we are able to provide consumers with a healthier option in preparing a tasty and balanced breakfast. Furthermore, as something that can be eaten on the go, belVita Banana & Oats is also a convenient option to complement the busy routine of modern Malaysians. belVita Breakfast Biscuits are to be eaten as part of a balanced morning meal to provide consumers with the energy to start the day well. It is best consumed with fruits, dairy and cereals that provide the perfect combination of carbohydrates, protein, fat, vitamins, calcium, iron and zinc. 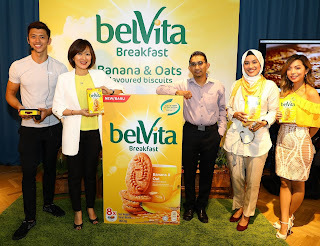 belVita Breakfast Biscuits was launched in Malaysia last year and has been receiving tremendous response from consumers since. The new variant is belVita’s third, following the introduction of its Milk & Cereal and Honey & Chocolates flavours in August 2016. The variant is available at all major hypermarkets, supermarkets and convenience retail stores from August 2017 onwards. All belVita biscuits contain at least 50 percent cereal ingredients to provide complex carbohydrates as a key energy source to fuel the morning. belVita Breakfast Biscuits are also a source of fibre, and contain at least 8g wholegrain per serve and source of eight vitamins and minerals. When eaten as part of a balanced breakfast, it provides nutritious energy for people to start the day well. Mondelez Malaysia (formerly known as Kraft Foods Malaysia) is the nation’s Favourite Snacking Company and home to iconic brands such as Oreo, Cadbury Dairy Milk, Tiger Biskuat, Jacob’s, Chipsmore, Choclairs and Twisties. For generations, our brands have been trusted by Malaysians for their quality, safety and taste. With over 1,600 employees and three manufacturing plants in Shah Alam, Johor Bahru and Prai, we work together every day to Create Delicious Moments of Joy by sharing the world’s most favourite brands of snack foods with our consumers. Over the years we’ve been known as Kraft Foods – one of the fastest growing food companies in the world. As of 1 July 2013, we are known as Mondelēz International. Mondelez Malaysia is a part of the Mondelēz International group of companies. Visit www.mondelezinternational.com and www.facebook.com/mondelezinternational. Wow... Campur pisang.. Cam menarik nie.. Nanti sha cari..